Yes, this is a bold claim. But my soul claims that it is true. My life is dramatically changing because of these truths. Yes, another bold claim. But it is straight from the mouth of Jesus, the One who IS the Way, the TRUTH, and the Life. Does your soul crave true rest? Not a mere break, but a deep inner confidence that everything is ok.
You can have this rest if you embrace the following. We could call them “3 simple steps”. But they’re not really simple, and they’re certainly not structured steps to take once and arrive. You already know the verses often taught about rest. But don’t allow the familiarity to cause you to miss the truth. 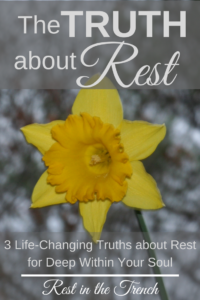 These three truths give guidance for a life pursuit of rest. You can begin practicing them today. But then commit to embracing them for a lifetime. True rest only comes from Jesus. I often wonder what cisterns I am digging that are leaky, allowing my opportunity for rest to slip out of my life. I can seek rest in organization, vacations, and activities. But true rest only comes from Jesus Himself, so we must seek Him. He says, “Come to Me,” so decide to draw close. Spend time in His Word. Sing along with a worship song. Talk with Him in prayer. Thank Him for who He is and what He has done in your life. Pause life for a moment to be still with Him. To be restful, we must continually draw close to Jesus. You cannot force rest in your heart or your life. Rest has almost become trendy in modern church culture. But are we missing the point? We carve out time for vacation. We take a nap. We give ourselves permission for “me time”. But true heart rest is not the results of our works. Rest cannot be created. I prefer to be on the giving end of help. Yet blessing abounds when I embrace humility in a choice to receive. Blessing for myself and for the one who gives. 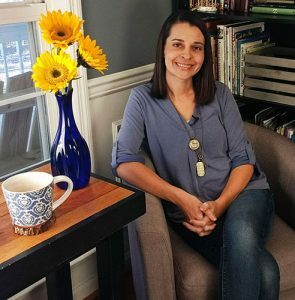 Could it be that receiving rest from Jesus would bless the heart of Jesus? To be restful, we must receive the gift He longs to give. Rest is not a destination. You can take an active role in receiving Jesus’ rest. Yes, you can take an active role. Is this contradictory to the truths above? Not really. Rest can only be received as a gift from Jesus as we draw near to Him. Yet in His grace, He invites us into the process. He invites us to share His yoke and offers to teach us as an older ox would guide a younger one as they prepared the soil for planting. Only the Holy Spirit will bring a harvest of fruitfulness. But we can prepare the soil of our hearts and plant seeds of rest. Choose kindness. Honor the Sabbath. Confess wrongs. Speak gently. Schedule rest stops. To be restful, we must sow seeds of rest in our lives. Embrace these truths and enjoy the life-changing rest that Jesus longs to give you. Seek rest in the person of Jesus. Receive rest as a gift from Jesus. Cultivate rest through a journey with Jesus. Watch your life change as you find His rest for your soul.